Let D be a digraph. The competition graph of D is the graph sharing the same vertex set with D such that two different vertices are adjacent if and only if they have a common out-neighbor in D; the phylogeny graph of D is the competition graph of the digraph obtained from D by adding a loop at every vertex. For any graph G with n vertices, its competition number \(\kappa (G)\) is the least nonnegative integer k such that G is an induced subgraph of the competition graph of an acyclic digraph with \(n+k\) vertices, while its phylogeny number \(\phi (G)\) is the least nonnegative integer p such that G is an induced subgraph of the phylogeny graph of an acyclic digraph with \(n+p\) vertices. 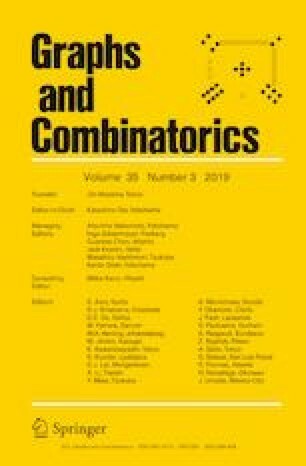 This paper provides new estimates of the competition numbers and phylogeny numbers of complete multipartite graphs with uniform part sizes. Accordingly, we can show that the range of the function \(\phi - \kappa +1\) is the set of all nonnegative integers. We also report results about a hypergraph version of competition number and phylogeny number. We are grateful to Peter Cameron for teaching us some useful facts on Latin squares. We thank the referee for providing a simple proof of Theorem 8 (ii). This work was supported by STCSM (17690740800) and NSFC (11671258).